Renkostreet trading system review - Does it really work? 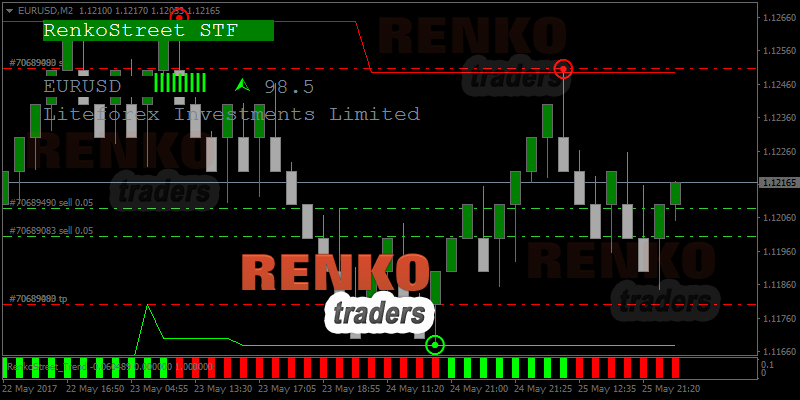 Home > Renko Strategies > Renkostreet trading system review – Does it really work? Renkostreet trading system is a commercial trading system that combines technical indicators that are used on Renko charts. The makers of Renkostreet trading system call it a trend following system that comes with triple confirmation. A quick glance at the Renkostreet trading system reveals that it can be used on both the major and minor currency pairs. The Renkostreet trading system visually combines the channel indicator, the pivot high lows or semphore indicator. There is also a trend strength indicator that depicts trends using a histogram. I must admit that I’m not a big fan of commercial trading systems. In most cases, the makers are more inclined to hype up the product than add anything of value. A quick glance at the Renkostreet trading system has the very same feel of hype than reality. The Renkostreet trading system is commercially sold for $59.00, marketed as a “special price.” The original price is claimed to have been $99.00. A typical marketing strategy that is seen among the trading systems you usually find on websites such as Clickbank. The Renkostreet trading system comes with the following indicators, templates and EA’s. How to install the Renkostreet trading system? 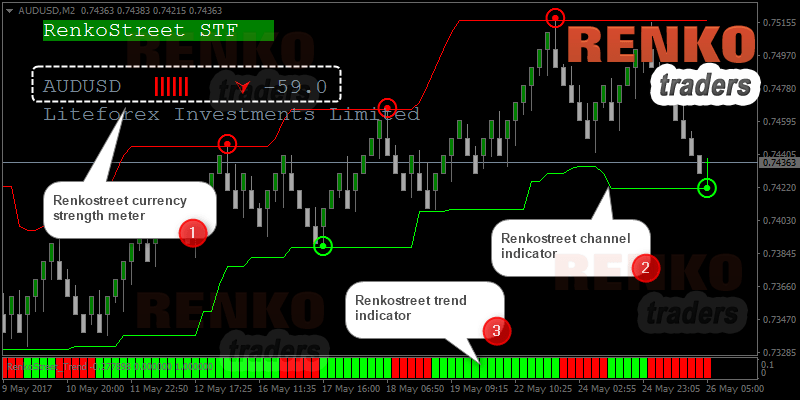 The Renkostreet version 2 makes use of the Renko expert advisor (version 3.2). We have already covered a review of the Renko expert advisor version 4.3 here. There is however a drawback in using version 3.2, as it does not update Renko charts when the markets are closed. It is therefore better to use Renko expert advisor version 4.3 instead which works even when the markets are closed. Once you install the indicator and open the offline renko chart, you can simply right click on the renko chart and select from the number of templates that are available. How do the Renkostreet indicators work? There are three indicators at work in the Renkostreet trading system. Once you select a template, you will see three main elements on the trading screen. On the top left is the Renkostreet STF indicator. This is a currency strength indicator which shows you whether the trend is bullish or bearish. The strength meter also shows a numerical value with 100 being the highest and zero as the lowest. The next indicator is the Renkostreet channel. This indicator looks somewhat like the Donchian channel indicator combined with the semphore indicator that plots pivot highs and lows. An important point to note is that the high and low indicator repaints. According to the makers of the Renkostreet indicator, the repainting factor shouldn’t be an issue. This is because a signal is valid only when you get a confirmation from all three indicators. Finally, we have the Renkostreet trend indicator. This indicator depicts the trends with the buy and sell signals, signaled by the red and green bars. How to trade with the Renkostreet trading system? To trade, you need to get a confirmation from all three indicators mentioned. This means that for a buy set up, we need to have the following rules to be met. The currency strength meter must show green. The Renkostreet trend indicator signals a buy and the Renkostreet channel indicator plotting a local low. Since the Renkostreet strength meter is always changing, it makes it difficult to at least visually backtest past signals. A sell signal formed while testing this trading system. We used a 10 pip EURUSD Renko chart for the Renkostreet trading system. The first entry was delayed as I entered the trade 10 pips later. So, the initial stop loss was set 40+ pips at the recent local high that was formed. The trading rules from the Renkostreet trading system suggests to go long or short the moment you get an alert. The recommended take profit level is expected to be 10 – 15 pips before the horizontal line. However, the risk/reward set up wasn’t that great. After price pulled back a box higher, a new short position was taken, making it similar to the original entry. Despite this fact, the risk was around 40 pips while the reward was about 30 pips. What I noticed was that price action continued to push higher. The currency strength meter also quickly reversed from the -35.8 you see above to +99 in matter of a few minutes. See the next chart below. Following the rather unexpected (but not surprising) reversal, I switched to another trading method outlined in the strategy section and managed to squeeze out a profit. In conclusion, the Renkostreet trading system, as with most of the Clickbank trading systems, offers a lot of hype but does little to stand up to the claims. You might get an odd winning trade here and there, but the basic risk/reward set up means that your winners need to be more than the losing trades. Renkostreet trading system doesn’t justify the fact that you use three separate indicators only to get mediocre trading results. What is interesting to note is that some of the points mentioned by the makers of Renkostreet trading system is contradictory. For example, in the manual’s frequently asked question, the Renkostreet trading system developers mention that the system does not give reliable signals. So, I wonder if we need to thank god for losing $59 on a worthless trading system such as Renkostreet? Furthermore, the makers of Renkostreet also note that one should look at H4 and daily candlestick charts, which is rather ironic. If you want to trade with Renko charts, you stick to Renko charts. Switching back to H4 and daily timeframe kind of defeats the purpose. Last but not the least, this comment from Renkostreet tops everything. As a final note, there are better and more simpler Renko trading systems out there and Renkostreet is definitely not worth the $59 price that comes with it. What are Renko charts and how to trade them?